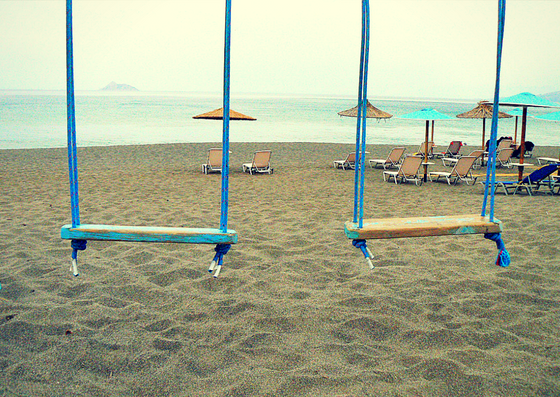 On this sandy beach you can enjoy both natural shade under beautiful trees, or rent a sun bed with an umbrella. There is a big parking lot, a taverna and some rooms to rent if you feel like spending the night. The view of the stones is impressing, you can’t get tired of that. 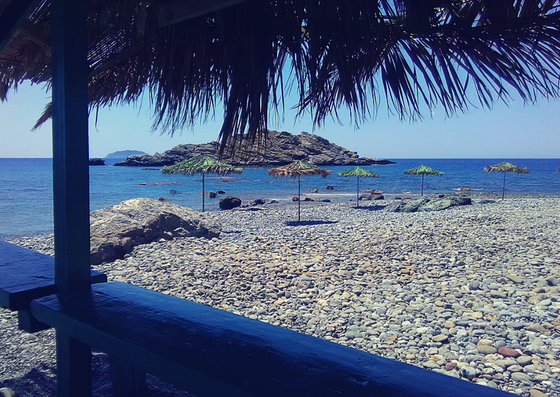 This rocky beach lacks of natural shade during most of the day, but you can rent sun beds and umbrellas for 3 euros (one person) or 6 euros (2 people). What I liked most about this place is a wooden stair that leads to a path on to the upper part of the hill, the view from up there is amazing! Don’t miss the video that we recorded up there :-), you’ll will find it at the end of the post. 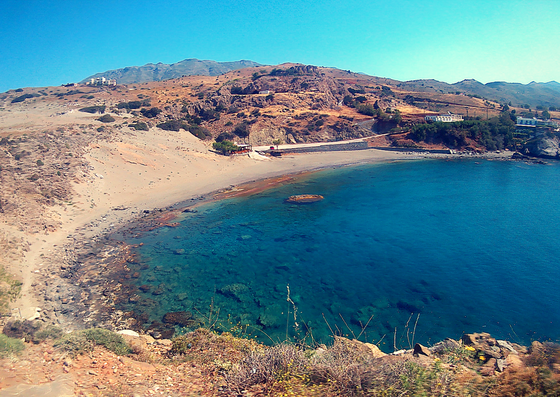 On this beach Yyou can enjoya proper parking lot and a taverna. 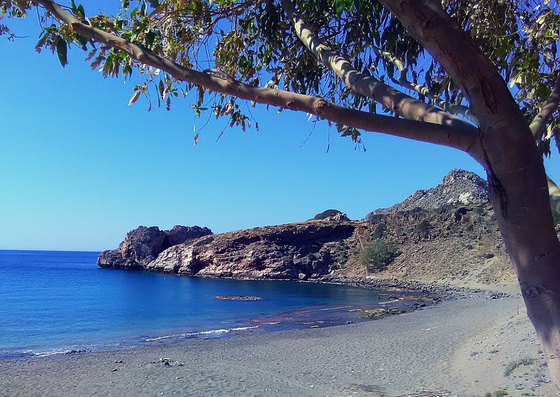 We found this rocky beach totally by chance, we were roaming around the olive tree fields and decided to leave the car at the edge of an unpaved road that may lead to the sea… And there we got! Someone placed some umbrellas on the rocky little beach, we didn’t have to pay for them but I don’t know if they may be there for rent in high season. We spend most of the day under a hand made gazebo; for what we saw someone must use it to cook and eat barbecue, but we were almost alone that day and nobody bothered us staying there. Laying on the ground can be bothering as the rocks won’t let you feel totally comfortable, so the benches under the shade of the gazebo were just perfect. Kalamaki is a really small village with a large sandy beach divided in two areas: the first one, closer to the hotels and the restaurants, is fully equipped with sun beds and umbrellas, but if you walk south for 5 or 10 minutes you’ll find the most isolated part, where you can just lay down under one of the many huge trees, and that’s the place I liked most! 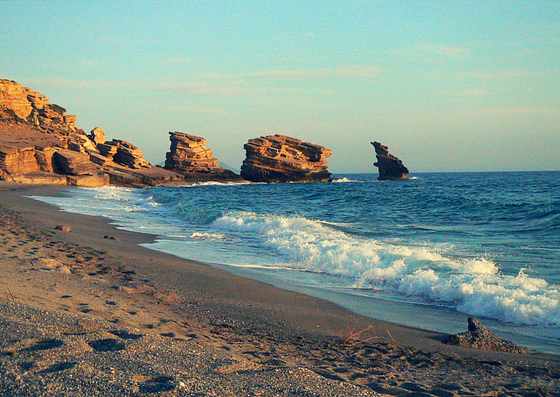 This beach is just past Kalamaki, you can reach it walking south on the shore and you’ll find it as soon as you pass by a beautiful heap of rocks that ideally divides the two areas. Kommos is well know for being a naturist area, and for hosting a small archeological site of the ancient port (we didn’t have the possibility to visit it though). You can find natural shade both among the big rocks and the trees, but we didn’t see any bar or taverna. If you are coming by car you can leave it on the streets that lead to the area. This is one of the most famous beaches of the area, and not my favourite. Even if the place is really beautiful, it can get far too crowded for my tastes. Matala is famous for two attractions: the caves that surround the beach, and that were an ancient roman cemetery (you can visit them for 2 euros), and the small enchanting village. Here you can feel like you are traveling back to the seventies…. everything will remind you of the flower power mood: grafitis on the walls and on the pavement, old cars painted with flowers… bars displaying memorabilia of the time. It’s a great place if you are looking for some night life but not for big clubs, and you can also do some shopping. 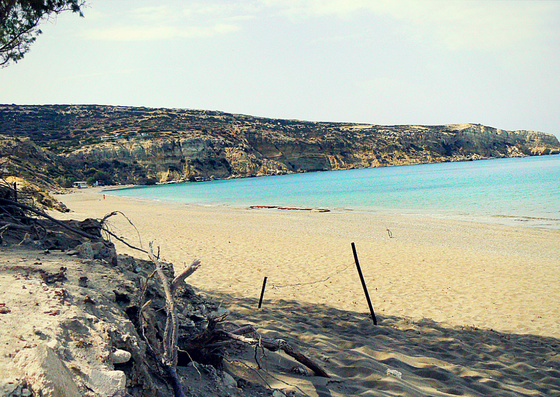 I prefer more laid out place but I enjoyed visiting Matala for a day. 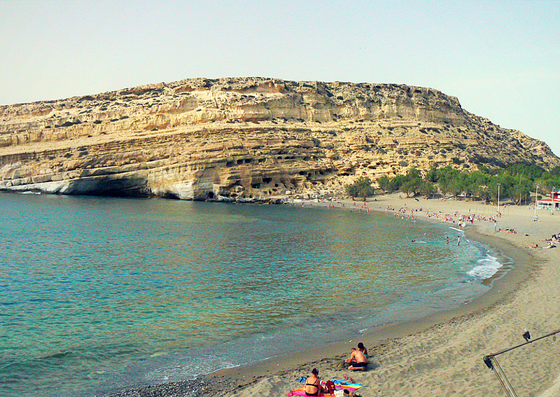 The great advantage of Matala beach is that you can reach it by bus! myvegantrips, thanks for the article post.Really thank you! Great.